All Aboard! Santa Express Train! | More Crunchy Beach Mama! All Aboard! Santa Express Train! I just got the best email showing me THE coolest thing ever! Santa Express Train runs through Colorado and is about to begin boarding this month. 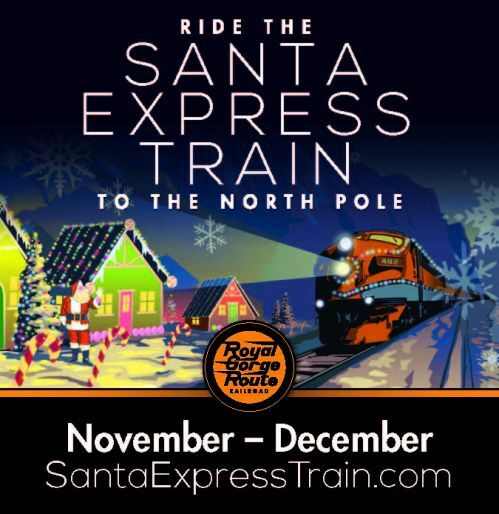 Join them for a magical journey through the Royal Gorge to the “North Pole” where the train makes a special stop to pick up a very important passenger – Santa! Every family will enjoy classic Christmas carols and hot cocoa while making memories that will last a lifetime aboard the Santa Express Train. Skip the fast food this year and enjoy our delicious, locally sourced, family friendly menu. Make your reservation now for the Santa Express Train, as spots fill up quickly. Visit the website or call us to make a reservation for an unforgettable journey on Colorado’s top Christmas Train! Visit www.RoyalGorgeRoute.com for a full schedule or call 1.888.724.5748 to book your trip today! Watch for my review at Crunchy Beach Mama at the end of the month. So excited! Congratulations, Becky! And dang, 22?! You definitely deserve the prize. Not just 22 books but reviews too. I definitely aspire to being such a prolific reader.And thank you to Quirky Girls Read for such a fun challenge. I look forward to next summer when I will actually enter a review (or two). My 12 year old daughter and I read Frankenstein the last two weeks of August but I didn’t get the review written in time. It was fun nonetheless We start Hamlet on Monday which, by the way, was her pick. , and I quote although with apt modification – There is nothing that is wrong with India which cannot be set right with what is right with India. Don’t get your undies in a bunch. Salman is alright. Also, second chances need to be given. Law does not allow that, humanity does. Our priorities are different. Lets call a truce on that note. Point of correction, AIG is not pulling or did not pull out, they were kicked out more or less(not really), actually just replaced by Man Utd.